When referring to commercial vehicle engine bearings, what is generally meant are the main crankshaft and the connecting-rod bearings all working under conditions of extreme pressure. The spectrum of materials ranges from traditional aluminum-tin (AISn), through the more robust aluminum-tin-silicon (AlSnSi) and electroplated bearings up to the sputter bearings capable of enduring maximum load. In recent years, this auto-industry supplier has been systematically expanding its range of engine bearing materials, always with the objective of high robustness and reliability in series applications. A major consideration in these endeavors is environmental compatibility, with zero-lead solutions throughout. Where necessary, various plain bearing materials can be combined to deliver cost-efficient solutions. 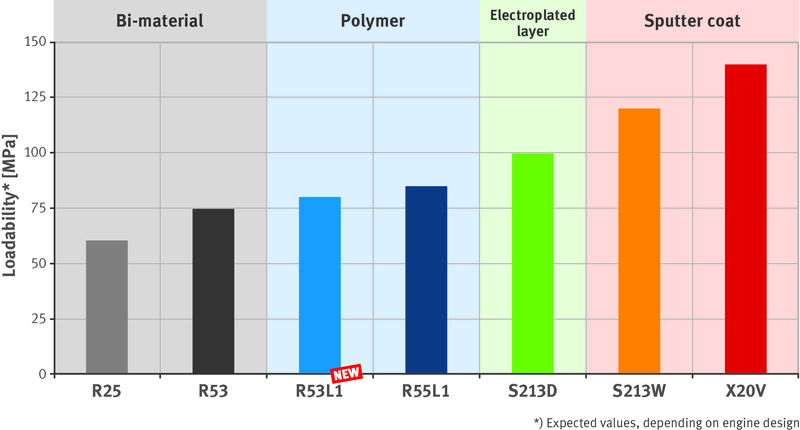 The new polymer bearing R53L1 has been further developed from the first generation of its kind and is based on the proven R53 steel-aluminum material as a lining for the polymer layer. This substrate, already well proven, enhances bearing robustness through its outstanding dirt tolerance, in all offering improved wear resistance with no compromise on robustness. Another advantage of the new bearing is its very low friction coefficient in mixed friction conditions. This is due to the proven solid lubricants MoS2 and graphite, already a feature of the first polymer generation. Hence, the material has a very low coefficient of friction even for polymer bearings.